LINKS TO OTHER SITES FOR HEALTH INFORMATION, TOYS, ETC. Birds are more than a bunch of pretty feathers. Some smaller birds, like canaries, finches, and parakeets will be happy to sit in a cage with toys to keep them busy. The larger birds need larger amounts of attention, and more of your time. They can live from 20 to 80+ years, so they should be considered a companion rather than a pet.When you adopt a parrot, consider it a new family member since it will live as long as you do. "A study by the American Veterinary Medical Association estimates that there are 56 million cats, 53 million birds, and 52 million dogs in American homes." PARROT, common name generally applied to members of the large bird family Psittacidae; groups of parrots that have their own common names include the cockatoos, lories, lovebirds, macaws, and parakeets. In length, parrots range from the buff-faced pygmy parrot of New Guinea at 3 inches to the hyacinth macaw of South America at 39.4 inches (almost 4 foot long). 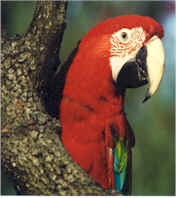 A large part of the macaw's length is attributable to its long tail. The heavy demands of the cage-bird trade, together with loss of habitat, have resulted in many species of parrots becoming endangered. Thousands of parrots are brought into Europe and North America annually, both legally and illegally, and many do not survive the journey. 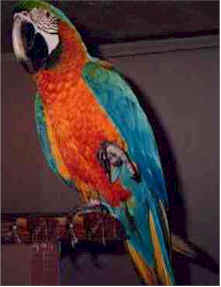 In most countries the capture, export, and import of parrots are strictly regulated, but the laws are difficult to enforce. 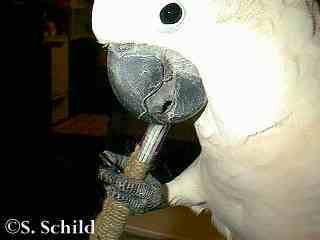 Ideally, only those parrots that have been bred in captivity should be kept as pets. 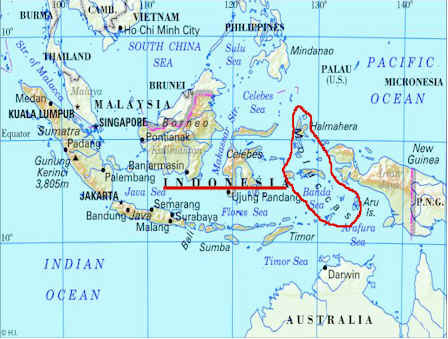 Map of Indonesia showing the Moluccas Islands circled in red. Most parrots are tropical, with only a few species reaching northern and southern temperate areas. They are found in South America, Australia, New Guinea and the Moluccas Islands of Indonesia. Few species inhabit Africa and mainland Asia. The most colorful parrots are the lories, in which reds and greens predominate, but blue, purple, brown, yellow, and black also appear. 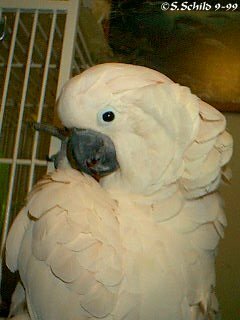 The cockatoos are mostly white, black, or peach with touches of yellow, red, or pink. 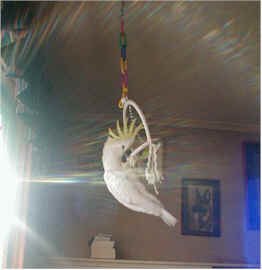 It is believed that Umbrella Cockatoos and Moluccan Cockatoos are the most lovable and cuddly of all the Cockatoos. It also takes an enormous amount of work and time to keep them that way. Just like cats and dogs, birds depend on their people. It is your responsibility to provide your companion a safe happy life. or when I am sick. When you decide you want a bird, learn about them first. You will want to start with a completely weaned baby or an adult bird. You need to be sure that you start from day one and establish a routine for when the bird will be in his cage, and when he will be out. Dont spend hours with it for the first few days unless you plan on keeping that routine. Most birds also require 10-12 hours of sleep every night. If you keep their cage where there is a lot of night lights or noise, you should consider covering their cage on 3 sides to give them a quiet spot. Parrots have curved, hooked bills and short legs. Their toes are zygodactyl, that is, the first and fourth are turned backward. They walk awkwardly (pigeon toed) but are excellent climbers, often using their bills to pull themselves up to a higher branch. In most parrots the tongue is thick and muscular, used for manipulating seeds. Fruits, nuts, and seeds are their principal food in the wild. You will need to teach your bird 2 basic commands. Step Up and Step Down. If you are not comfortable offering your hand or wrist, start with a stick. This is a must to teach your bird. When you say step up, the bird should lift its leg. In order to teach this, you need to put the bird on a training "T"-stand, in a quiet area. Say "step up" firmly, and place your closed hand or wrist, or stick, in from of the bird. He may reach out with his beak to test the surface and make sure you can hold his weight. Once on your hand, say "step down" and have him get back on the "T" stand. Repeat for 10 minutes and always praise him for correct actions, say nothing for wrong actions. End on a positive note, and do this several times per day. This Harlequin Macaw is ready to step up. ABOUT BITES: The first rule is to not jerk away. If the bird bites you and holds on, gently push toward the bird. Once the bird lets go, calmly say "NO" and put the bird in its cage for a short time out. Do not punish the bird as they do not understand punishment. Dont shout or yell, or wave your hands because birds think that is fun. Birds are very smart, they will try to bite you again to make you do that funny stuff. Remain calm. Virtually all parrots are hole-nesters, using holes in trees, termite mounds, rock cavities, or ground tunnels. The main exception is the monk parakeet, of temperate South America, which builds large nests of sticks. In the mid-20th century, many monk parakeets were imported to the U.S. as cage birds. Some escaped, and many owners, finding their pets unbearably noisy, simply released them. Well adapted to the temperate climate, they bred and formed colonies in several parts of the U.S., but in most areas an effort was made to destroy the feral populations, as this species is known to be a serious pest in agricultural areas of its native habitat. preening toys--Those that hang done with little ropes or that have little strips of cloth for the bird to rub his back and head on them and to preen himself. You need to keep several types in the cage and rotate them every couple weeks. Birds are very intelligent and they get bored easily. You need to always provide them with things to entertain themselves to prevent them from plucking out their feathers. This habit is almost impossible to stop once it starts, and can lead to self-mutilation, where the bird actually removes chunks of his own flesh. Rockie likes to chew on TV remotes and cordless phones. When he is out of his cage. I have to watch him all the time. He would not be safe left out alone. He would chew on anything, including carpets, furniture, walls, and electrical cords, and possibly electrocute himself. We play peek-a-boo with a towel and it makes him laugh. Now when I am in another room or my back is to him, he will call out "peek-a-boo". That is his way of saying "Hey look at me, I want to see your face". 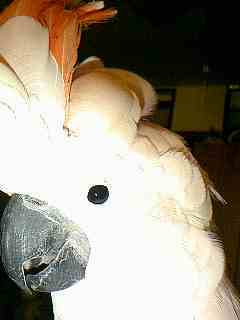 NOISE: A Cockatoos scream is very very loud, and can be heard down the block. They scream every morning and every evening. Sometimes they develop behavior problems and scream all day. If you or a family member is sensitive to loud noises, dont get a Cockatoo. 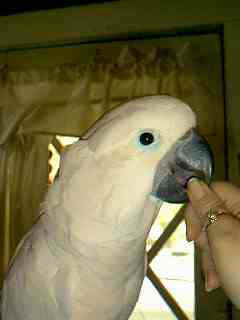 The ability of many parrots to imitate the human voice and other sounds is one reason for their popularity as pets. 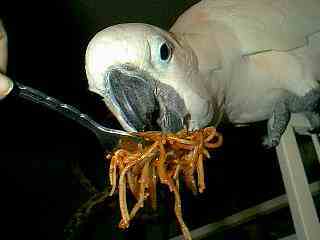 The best of these is the African gray parrot, Psittacus erithacus, a 12-inch gray bird with a short red tail. Experiments have shown that individuals of this species may have cognitive abilities equal to those of porpoises and primates. Amazons are also among the best talkers. BATHS: Just like you, birds need baths every day. Mist your bird with clean cool water from a clean unused spray bottle. Some birds may enjoy getting in the shower with you. 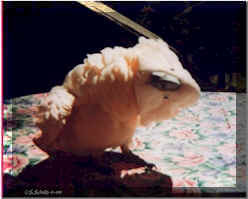 Never let your bird get chilled, wrap it gently in a towel with its head out, while it is wet. Have the breeder or pet store clip the wings and check the toe nails before you bring your bird home. You will need to have this done occasionally. If you decide to do this yourself, be careful as you could accidentally clip a blood feather and your bird could die. Have your veterinarian show you how to do it safely. If you need to take the bird outside, even just to sit in the yard, use a harness and leash. Always use a carrier (like a cat carrier) in the car, placed on the floor. Your bird will molt (lose old feathers, grow new feathers) a couple times a year. You will be much loved if you help preen the little sheaths that cover the feathers on the top of the birds head. Be sure to stay at least 1/4" away from the blood line, break the sheath with your fingernail and it will fall off. 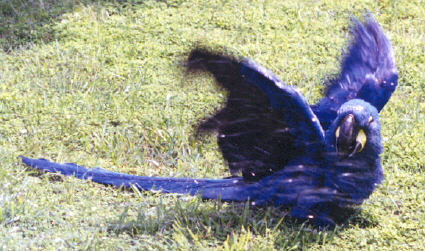 You need to be extra careful during the molt to watch that the large blood feathers on the wings and tail dont break. They are hollow and filled with blood. If one breaks, it will cause the bird to bleed to death. The broken feather needs to be removed quickly. It may help to carefully wrap the bird in a towel. Grab the bleeding feather in needle nose pliers, close to the body of the bird. Pull quickly, straight out from the body. Keep cornstarch or flour handy to use to stop bleeding. Just remember, a bird can bleed to death in 15 minutes or less. Keep in mind birds are still wild animals, unlike dogs & cats, who have been bred for 1000s of generations as pets. Some species of birds have only been bred for captivity for just a few generations. Birds are a flock animal. They live in groups of 16 or more. You and your family will become your birds flock. When you eat, they will eat, when you sleep, they will sleep. Keep them included in family activities. Keep their cage in a high traffic area, with one side to the wall. You can sit and laugh at the TV together. Rockie and his cage are in the family room. He eats dinner when I do. He will scream if he doesnt get invited. He eats pasta, rise, some meat and vegetables, just like I do. When I laugh, he laughs. Never lock them away in a room by themselves. They need you. Birds are very emotional and need to be part of your family. Locking them away because they are messy or noisy is just like putting you in a dark room, all alone, with no one to talk to, and it won't make them change. That is just how birds are. If you cannot handle the loud noise or do not like to clean up after them, find another home for them. They deserve to be loved and treated with kindness and respect. I give Rockie little jobs to do. His chores include tearing up the envelopes from junk mail, and supervising me while I wash dishes. These are jobs he knows and loves as it includes him as a part of my flock. Stomping the foot - SHHHHH! Be quiet. Clacking the beak - I am Happy. Beak Banging - I am happy and may be looking for a mate and using tools to make my banging noises too. 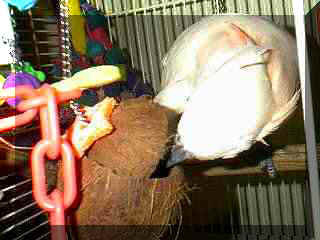 Grinding the beak - I am sleepy and content. High pitched squeal - Come get me. Raising the crest - What??? Fluffing with crest slightly raised - I am something special. Full fluff, crest erect, wings extended - I am excited or aggressive. Bobbing their head - Feed me warm moist food. Raising a wing - Scratch me please or stay away I am afraid of you. 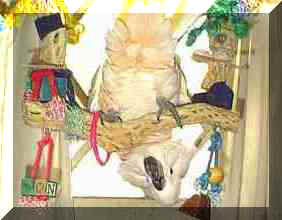 Fluffing the beak feathers- I am relaxing. Hissing - I Do not like that. Whining and crying - Pay attention to me, feed me, hold me. Dancing and strutting - It's great to be alive. A proper diet consists of seeds, nuts, some pellets and mostly healthy people food, such as vegies, grains like rice, and very little fruit. 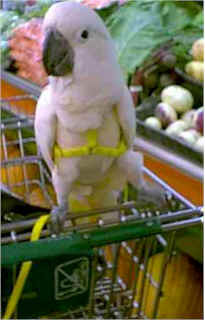 Never give your bird caffeine,(coffee, sodas), chocolate, fruit pits or avocados. Burning a Teflon� pan causes fumes that will kill your bird. Any strong fumes could be deadly. Toss, Fetch and Catch - which are variations of games where you use a soft, lightweight object such as a foosball or soft stuffed toy and either you or the bird tosses it and you or the bird catches it. Place birdy items in a drawer the bird can get into. Like your clean sock drawer. Hide surprises in there like walnuts and new foot toys and let the birdy find them. Singing games, like Itsy Bitsy Spider, BINGO, When you're Up, etc. Flying through the air games with the bird on your hand and you steady the bird and take it through the house. "I can do that too" game. The bird does something like stretch and you imitate them and then you do something like raise your arm and see if they will learn to imitate you. Blink. You blink, they blink. Peek a boo. Use a towel, a blanket or a cat tunnel. Read them children's books for entertainment, like pop-up books and musical books, and also try to teach them colors, shapes and parts of their body. Teach them to lay on their back in your lap. Then you can tickle their tummies and give them little toys to fight with upside down. "Horsy is gonna get you" Tap your nails on the surface and walk your fingers to the bird saying the above and tickle their tummy. Get on the floor with your bird and play with them. Take toys and even a box of soda straws and let them dump them and play with them while you play too. Just about every activity you do with them on the floor,even watching television together down there, is interactive and special to the bird. Play Bat Bird, lay on your back and hold our bird in the air singing bat man. One little greencheek now yells Bat Bat Bat as he plays. (1) The Bird will not eat. (2) There is discharge from nostrils or mouth. (3) The head is tucked under the wing or rump. (5) Weight loss is observed. (6) Large amounts of water are being consumed. (7) Breathing is labored, with the bird opening and closing its mouth. (8) The bird is listless, maybe even sitting on the bottom of the cage. (9) Any growths are noticed around the beak. (10) The bird sits low on the perch covering its feet to stay warm. (12) Black poop which can be a sign of hemorrhaging. but waking up. This can be a sign of a heart problem. A healthy recipe for your special friend. Follow the directions on a box of cornbread mix, but add to the batter some of your birds favorite fruits (sweet bread) or veggies finely chopped or diced. Also, you can add 1/2 cup of his healthy pellets that he may not eat normally, after soaking them in water, to make a mush. Mix all together, and bake. You will want to bake it slightly longer than the package calls for. 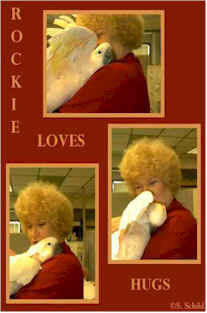 Rockie likes it more on the crunchy side. Freeze or refrigerate it in slices that you can easily warm in the microwave for a warm treat each day. Vary the recipe for variety. should hold together and not be crumbling. round of cooking. When cooled, serve to parrots. Refrigerate or freeze unused portions. completely with water. Cover the dish with saran wrap and vent the wrap. with saran wrap and let stand 10 minutes on the counter. potato masher, smash the cooked apples. Add a dash of cinnamon. Stir. National Veterinary Poison Control Center 1-800-548-2423 $45.00 charged to your phone bill per call, could save bird's life and a reference# with free 800 line if you need to call back on the same problem.